Follow our Getting Started guide to quickly add weather data and imagery to your web applications. 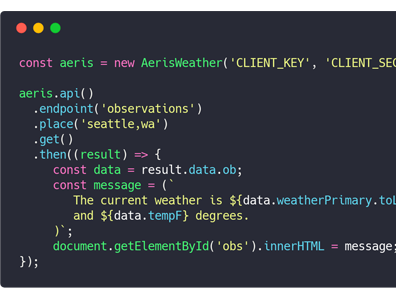 Data Requests Configure and request data from the Aeris Weather API. Read more about API data requests via the SDK. Map Image Requests Configure and request map imagery from the Aeris Maps Platform (AMP). Read more about map requests via the SDK. Interactive Map A fully-interactive weather map using one of several support third-party mapping libraries, including Leaflet, Mapbox, OpenLayers and Google Maps. Read more about setting up an interactive map with the SDK. Map View A lightweight weather map using static Aeris Maps imagery that supports animating weather data. Read more about setting up an basic map view with the SDK. Legends An easy-to-use view component for fetching and rendering one or more weather layer legends in association with map imagery from the Aeris Maps Platform (AMP). Read more about using legends within the SDK.